Visiting Nurse Association of Southeast Missouri is one of the most established, successful home health care organizations in the state. But for more than 30 years, its headquarters—housed in a former grocery store—did not reflect that success. Offices were dark with no access to natural light. And because the workplace lacked meeting and break rooms, VNA’s talented employees missed out on daily interactions and worked largely in isolation. They needed a change. When the VNA decided to find a new home in 2014, the organization’s leadership team sought a brighter future. Specifically, the team wanted a headquarters that would reflect the VNA’s mission and create a feeling of community among staffers. 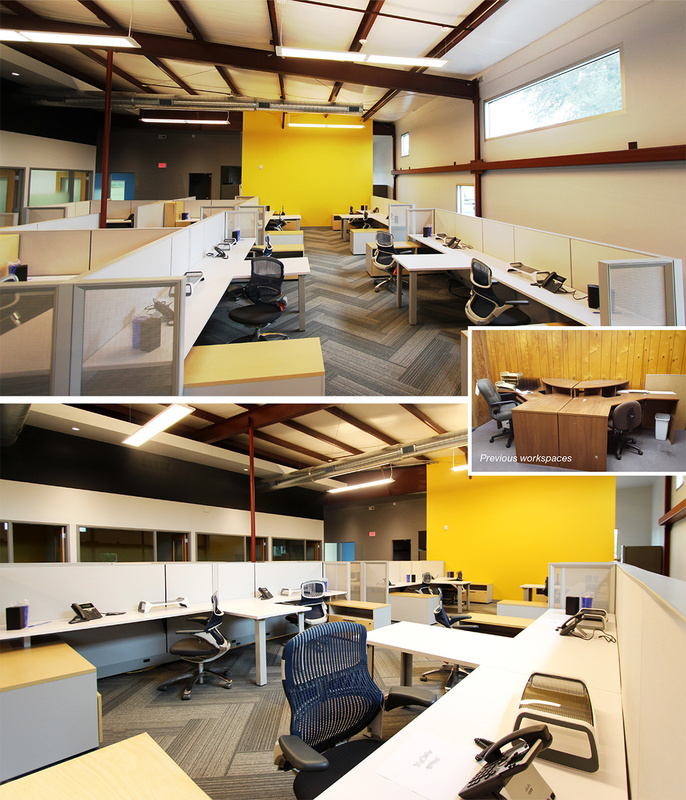 Located in the small farming community of Kennett, Missouri, the VNA worked with Space Architecture + Design, Knoll and CI Select to design a new space with an open office layout that could foster community and connection amongst the staff. Today, the VNA headquarters stands out as modern and beautiful, and thanks to the open layout, it is helping the VNA’s team be more motivated and connected than ever before. The VNA has a history of unusual workspaces. It first occupied an office in the Missouri Department of Health before moving to a historic, four-story building with a ballroom. When the historic building was sold, the organization was forced to quickly move— bringing the VNA to its next home, a former grocery store building. Pressed for time, with only 30 days notice, the VNA put up interior panel walls to create offices but made no other modifications. As a result, employees had no access to natural light in their windowless workspaces, nor to common areas. Most of the staff worked in relative isolation. The dark, disjointed atmosphere hurt morale, eventually driving the organization to seek a new home. “We knew our environment was not healthy. We had employees with attendance problems and some felt depressed with their surroundings,” says VNA CEO Teresa McCulloch. Employee satisfaction dropped further as the neighborhood grew increasingly dangerous after dark—a real problem for nurses who came to the office at night. It was clear to the VNA team that it was time to commit to a move. Through an unexpected chain of events, the VNA was able to donate its space to a charity that makes meals for those in need, and the process to move was set in motion. 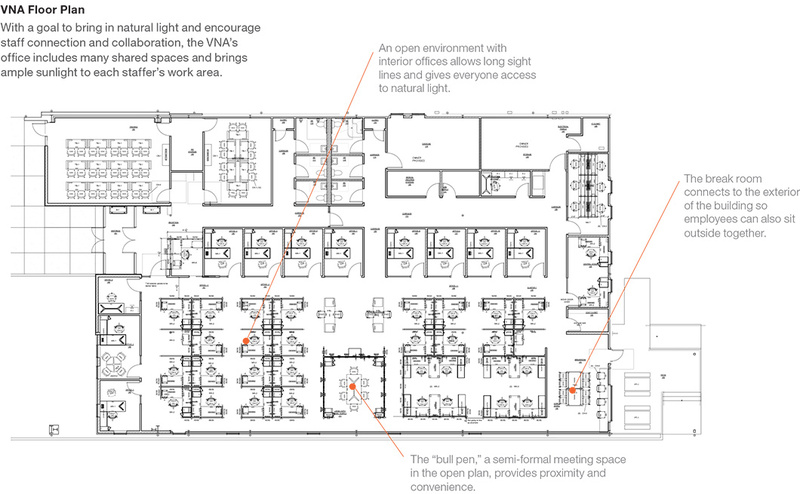 “The VNA wanted more of a collaborative space. They were coming from high panels and really closed in. They wanted to open it up and make it have a fresher look as well,” says Karey Brown, a Knoll Sales Representative. The new workspace would need to create areas for collaboration and the social interactions that build a thriving office community. It would be a radical shift. In the old space, the majority of employees had a private office or shared an office with one other person where they spent the entirety of their work day. Most employees also ate lunch at their desk, alone, simply because there was nowhere else for them to go. The Space team played a key role in communicating how a more open office design that incorporated areas for collaboration could radically improve the daily experiences of employees, supporting the VNA’s culture, people and ultimately, its mission. A central design driver was an aesthetic one: to inspire the VNA’s staff to high levels of professionalism and to honor the staff as top-tier professionals. “They are the talented ones who make our success possible,” notes McCulloch, who wanted the staff to feel proud of their new headquarters. The VNA team sought a design that would reflect the organization’s trusted service and quality care with visitors. They also wanted to add a quality structure in the city. They tasked the design team with creating a space where visitors would feel like an important part of the VNA community, with a particular emphasis on a clear, welcoming reception area. A former Sear’s appliance store, the VNA’s new home blends into its surrounding with neutral tones and natural materials. Its sloped roofline at the entrance recalls the VNA’s logo and draws attention to the front doors, welcoming visitors. The VNA chose a single-story building—a former Sears appliance store—as the site for its new headquarters and set about finding ways to bring in sunlight, starting with the building’s façade. The Space design team exposed the building’s structure and installed modern steel-framed windows to help bring in light to the center of the plan. Today, the entire south wall of the building is glazed. “There are also openings in the west wall that allow a lot of natural light to come into the building. We had the limiting factor of the bracing toward the wall. So, we created a system of openings to bring in natural light. We made a huge difference right near the open office area,” says Juan Devia, Space’s Architectural Designer in charge of interior design for the project. The design team paid close attention to how the VNA wanted guests to feel when entering the building. The goals were to make visitors feel important and help them understand the VNA’s mission and history. The reception area is housed in an addition made to the building’s front. The gable roof references the VNA logo, which is shaped like a small house. The outer points on the roof line join together at the reception entrance, making it a focal point. At the reception area, the design team used natural materials, applied in a manner to blend the exterior with the interior. For example, the stone just outside the reception area continues into the interior. While the reception desk has wood paneling and soothing white and grey tones. When guests enter the reception area they are greeted at the reception desk, which has two worksurface areas, one specifically for helping guests and another for the receptionist’s work. The worksurface is a transaction top from the Knoll Autostrada® line. Behind the desk is a router cut, aluminum VNA logo. There is also a timeline on the wall that shares stories and images of the VNA’s work through the years. By sharing their inspiring story of growth and service to the community, the timeline supports McCulloch’s goal of encouraging VNA staffers to take pride in their work. Located near the reception area, the conference and training rooms are also designed with visitor needs in mind. The training room has access from the outside so guests can enter it directly for a class or meeting. If the VNA hosts a party, the training room can accommodate that, too. There are cabinets for supplies and room to refrigerate drinks. “It’s a room with many purposes,” says designer Devia. With multipurpose in mind, the VNA chose furniture that could be moved around and stored easily. 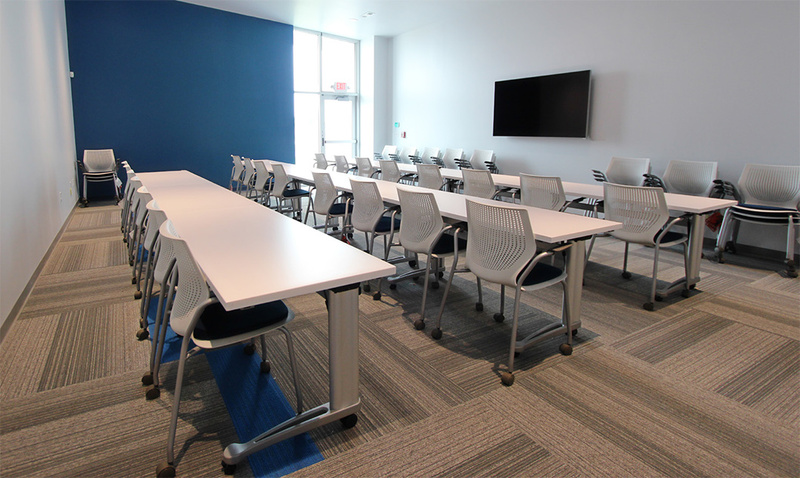 The training room’s MultiGeneration by Knoll® chairs are all stackable and on casters so they can be put away, as needed. The tables are Propeller® series and fold for easier storage. “If they want to put everything away they can,” says CI Select Senior Designer Kim Benner. The VNA also chose supportive MultiGeneration by Knoll hybrid chairs for the conference area. In the back of the office, where the majority of staff spend their day, the design team created areas for each team of employees: managers, visiting nurses and administrators. They stayed focused on efficiency, comfort and keeping all areas full of natural light. In the very back of the building, the hoteling workspace gives visiting nurses and therapists a place to work for any length of time. It holds a long, Antenna® Workspaces series table, with a low barrier privacy screen running down the length of it to provide some separation. Each station has a supportive, stylish Generation by Knoll® chair. Due to its “sit-how-you-want” capability, staff can easily charge their devices, write up visit notes, check email, download data and prepare for their next appointment. VNA managers have private offices located around the perimeter of the building. A corridor with a special carpet design separates the private offices from the rest of the interior. The only physical barrier between the private offices and the rest of the building is a glass treatment that becomes progressively more opaque toward the bottom. This treatment allows the offices to feel connected to the rest of the space, and has the added benefit of allowing natural light to enter the center of the building. Focused on efficiency, the VNA team took the suggestion of CI Select’s Kim Benner and chose a table desk with a credenza arranged in an L-shape for each private office. To create a modern aesthetic, a Dividends Horizon® table serves as a desk with both an AnchorTM credenza and storage. The office is very simple because one of McCulloch’s goals was to reduce clutter. The long desk surface at one height and the work credenza at a lower height suited the goal of a clean, neat look. The credenza allows for storage that is out of visitors’ view. “Since they were trying to go paperless, storage was really about personal storage not work stuff. You can hide clutter in the credenza,” Benner says. Each private office also includes a MultiGeneration by Knoll chair for visitors. 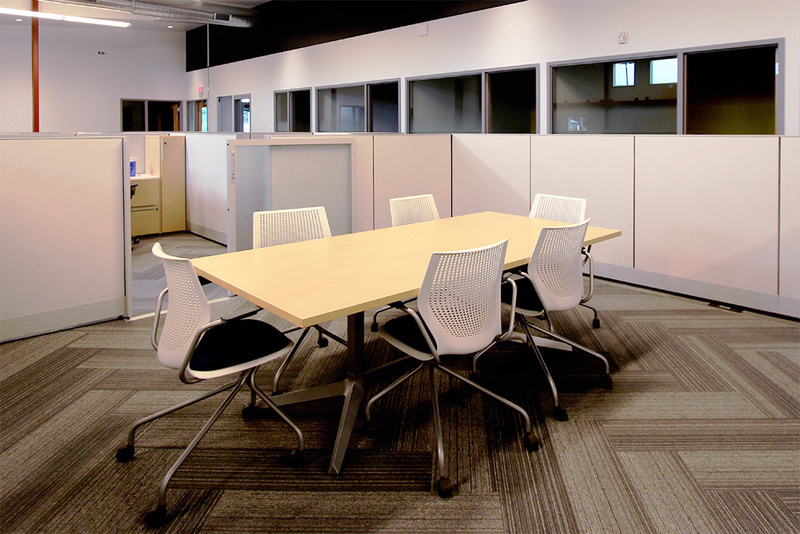 For administrative staff, several pods of workstations were created in an open layout. With help from Knoll and CI Select, the VNA invested in furniture systems that act like a kit of parts. “We were very smart about the furniture choices so the space could be reconfigured without buying a lot of new pieces,” says Benner. To ensure the staff’s range of postures and workstyles were well supported throughout the day, the a VNA team also selected Generation by Knoll chairs for workstations. The worksurface is L-shaped and one level, with 52-inch-high Dividends Horizon panels so each person has some feeling of privacy. The open office area received, perhaps, the most attention from staff. “In the beginning there was resistance from staff members to move to an open plan from private offices. In the old space, everyone had a big desk that was four legs and a surface,” says CI Select’s Benner. But McCulloch saw an open office space as the only way the VNA could afford to host their entire administrative team. “If you’ve worked in an individual office setting for over 30 years and then we put you in what may feel like office cubes… you can imagine how they might feel. But we knew it was the best choice,” McCulloch says. The VNA’s executive leadership team worked hard to educate the administrative team on the process of moving to open office. “It took time but everyone adjusted,” continues McCulloch. The design team provided each person his or her own primary workspace, estimated as a 7x7 foot space with as much surface area as possible. “We emphasized that their worksurface had not been reduced, just laid out differently,” says Devia of Space. Eight workstations comprise a pod, with a total of four pods in the open workspace. There is circulation around each pod, and an informal meeting space grounds the cluster’s center. 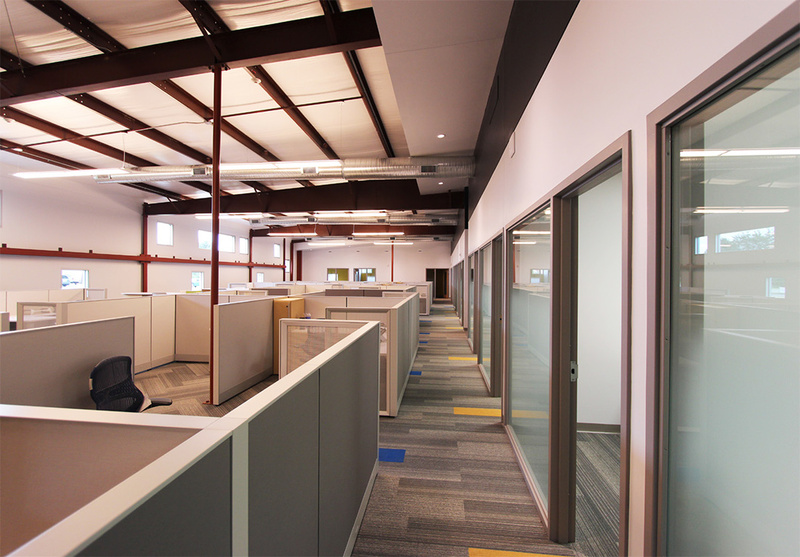 To help employees feel invested in the new, open layout, the VNA offered an allowance to employees to customize their space and select personal storage according to their individual workstyles and tastes. “They were helping to design their own spaces. People really got excited about personalizing their space,” notes Benner. 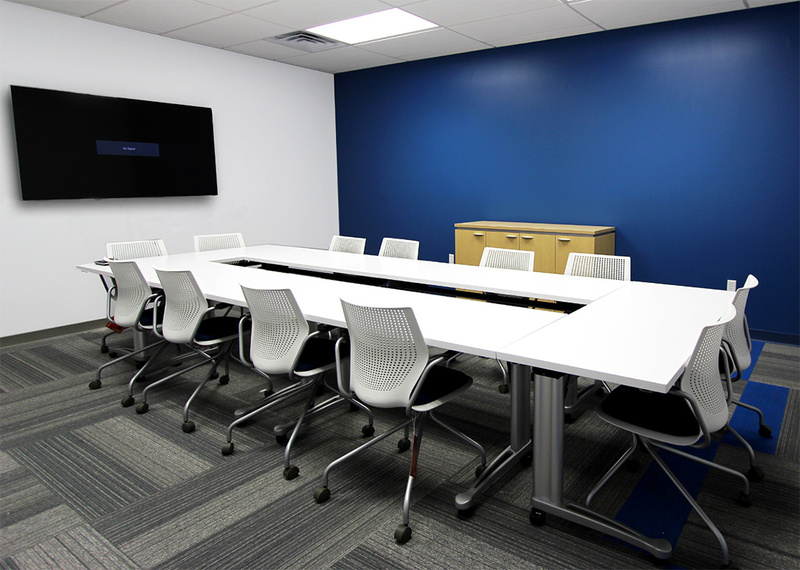 Continuing to push for greater efficiency and more collaboration, the architectural team created several shared spaces in the new office, including a work room, meeting room and break room. More than just as a place to print documents, the work room features a pair of taller work surfaces built using Reff ProfilesTM and Antenna® Workspaces by Knoll. “You have the versatility for a quick meeting while you’re standing up, doing paperwork around the printing area,” says Benner. “It’s an informal meeting area.” Each surface has storage underneath for printing supplies. Everything in the space is communal and intended to be clutter-free. The new, favorite meeting place for the team has been affectionately named the “bull pen”—a semi-private meeting area located in the middle of the administrative team’s pods. “It is not soundproof and only holds up to eight people, but staff love it and use it regularly,” says McCulloch. Devia says that the advantage of a semi-formal meeting space in the open office may be proximity and convenience. “It’s not completely private, but it’s visually separated when you’re in it. Informal meetings happen all the time. And it takes less time to book,” notes Devia. The meeting room perimeter is Dividends Horizons with sliding frosted doors that let light in. The table is also Dividends Horizon surrounded with lightweight, easily moveable MultiGeneration by Knoll chairs. Perhaps the most well-used addition to the VNA staff’s new space is its break room. Besides eliminating paperwork during the move, McCulloch made a rule that no one eats at their desk, and the results have been astonishing. “Now the kitchen area gets a little loud. It’s just amazing. We’re sitting down and eating lunch together. We know about each other. We’re communicating with each other,” says McCulloch. According to Benner, the break room was also kept very simple, since it is a high-traffic, shared space. It has two, square Antenna Workspaces series tables where employees gather, seated on brightly colored citron Spark® chairs. The break room connects to the exterior of the building so employees can also sit outside together to eat lunch. Reflecting on the path to their beautiful new home, CEO Teresa McCulloch admits she didn’t expect the positive change to be so significant. “I was the negative ninny. I hate to spend money. I didn’t think our space mattered that much. I was resistant.” Now she sees that her staff works more as a team and truly cares about each other. She also notes that casual interactions at workstations have increased. People sit on filing cabinets because they have a cushion on top, another habit she didn’t expect. “People pull them out and sit on them and have a conversation in their workspace.” She also thinks the color of the chairs in the kitchen has helped to set a good feeling in the space. “It’s bright and cheery,” she says. Plus, she loves to see people eating lunch together outside. “One employee had bouts of depression, some of which were attributed to her work environment. The new environment has absolutely changed her. She’s productive, she’s positive and she’s interacting. She says a weight has been lifted off of her shoulders,” says McCulloch, who also notes that employee absenteeism has fallen dramatically. She also says she sees the new exercise space being used more often throughout the day. The VNA was already a successful organization before the move. Now McCulloch says both professionalism and productivity are way up. “In the very beginning, we started hearing people say, ‘Oh my gosh, I need something else to do,’ because they are more efficient in their work.” She says her management team confirmed that the staff is getting work done much faster than before. McCulloch credits the office layout and the massive reduction in clutter for the boost in productivity. The VNA’s mission is to provide the best homecare in Southeast Missouri. The organization can be proud that its professional team of nurses improves patient safety and health in their own homes, rather than in hospitals or other health care institutions. Now the VNA has a physical space to match its level of service. “Their current workspace is really a reflection of who they are,” says Karey Brown from Knoll. “I was literally ashamed of our office before,” says McCulloch. “Now our space matches our reputation as one of the best home health care service providers in Southeast Missouri.” Devia of Space agrees and points to the vintage nursing pictures in the reception area as a beautiful way the VNA is now telling its story. “This is a very compassionate organization. The VNA takes patients that other providers refuse to accept. Their new building speaks to importance of their work,” say Brown. The Visiting Nurse Association of Southeast Missouri (VNA) is a private, not-for-profit home health service provider. Its mission is to help clients receive the support they need to be safe and healthy living in their own homes, instead of needing extended hospital stays. Founded in 1973, the VNA offers a variety of services, including skilled nursing, hospice, medical social work, physical therapy and speech therapy. Its service area includes 13 counties in Southeast Missouri, where it goes the extra step to serve the needs of clients.